Home CDN , children , crafts , feature , holiday , holidays , homeschool , March , papercrafts , printables , US , worldwide March 2nd - Featuring Dr. Seuss Freebies! March 2nd - Featuring Dr. Seuss Freebies! -- Theodor Seuss Geisel, the creator of The Cat in the Hat and How the Grinch Stole Christmas, was born at Springfield, MA on March 2, 1904. 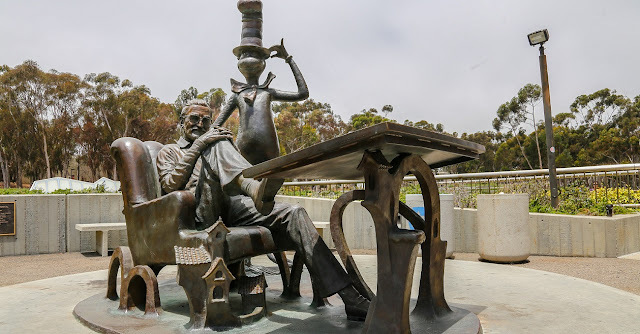 Known to children and parents as Dr. Seuss, his books have sold more than 200 million copies and have been translated into 20 languages. His career began with And to Think That I Saw It on Mulberry Street, which was turned down by 27 publishing houses before being published by Vanguard Press. -- Award-winning author Kathleen Krull zeros in on the formative first 22 years of the life of Ted Geisel. This is the first picture book biography of Dr. Seuss, written especially for his young fans who want to know what made him tick. The animals in the zoo his father ran and his fondness for drawing them, the injustices he suffered as the child of German immigrants, and his inherent sense of humor all fed into the imagination of this boy. He was a square peg in a round hole until he found he could make a living doing exactly what he pleased — doodling and writing funny things about the world as he saw it. • Dr. Seuss's Beginner Book Collection -- A perfect gift for new parents, birthday celebrations, and happy occasions of all kinds, this collection of five beloved Beginner Books by Dr. Seuss — The Cat in the Hat, One Fish Two Fish Red Fish Blue Fish, Green Eggs and Ham, Hop on Pop, and Fox in Socks — will be cherished by young and old alike. Ideal for reading aloud or reading alone, they will begin a child on the adventure of a lifetime! • Dr. Seuss: Hats Off to Dr. Seuss Collector's Edition -- The continuation of celebrating Dr. Seuss with the theme Hats Off to Dr. Seuss, a year-long celebration of the 75th Anniversary of The 500 Hats of Bartholomew Cubbins. Both DVD and Blu-ray will include fan favorites; The Cat in the Hat, Green Eggs and Ham and Other Stories, The Lorax, How the Grinch Stole Christmas, and Horton Hears A Who! - A day where you just want to snuggle up and read a good book or watch an old movie, drinking a cup of hot tea and having a bowl of soup for lunch. It is a day to just be, not concerning yourself with fixing anything, a day without concern. I love days like that, lazy days, days where the mind can take a rest. - Today is not a day to do the same old stuff. Rather, it's a time to recognize the boring nature of your daily routine and make some exciting changes. Find new and different activities, projects, and hobbies. Attend an event. Do something, anything, different. You will be glad you did! - Banana cream pie is a rich dessert perfect for any occasion. Its custard filling is made from eggs, milk, cream, and flour. Another thing to love about banana cream pies is their graham cracker or pastry dough crust. In a 1951 survey conducted by the United States armed services, banana cream pie was ranked the soldier's favorite dessert! - The venerable goo is a company dream come true. With little advertising, manufacturer Binney and Smith have churned out more than 300 million units - roughly the equivalent of 4,500 tons of the stretchy stuff which would be enough to build a life-size replica of the Goodyear Blimp. Throughout his life, Earl Warrick insisted he and his colleague, Rob Roy McGregor, received the patent for Silly Putty before James Wright did; but Crayola's history of Silly Putty states Wright first invented it in 1943. - A joint board of state and federal highway officials created the first system of interstate highway numbering in the US in 1925. Standardized road signs identifying the routes were also introduced. Later the system would be improved with the use of odd and even numbers distinguishing between north-south and east-west routes, respectively. - A nationwide reading celebration taking place annually on March 2nd — Dr. Seuss’s birthday. Across the country, thousands of schools, libraries, and community centers participate by bringing together kids, teens, and books, and you can too!